The Guardian Fall Protection Bucket of Safe-Tie is a roofing kit built for the roofer, by the roofer. 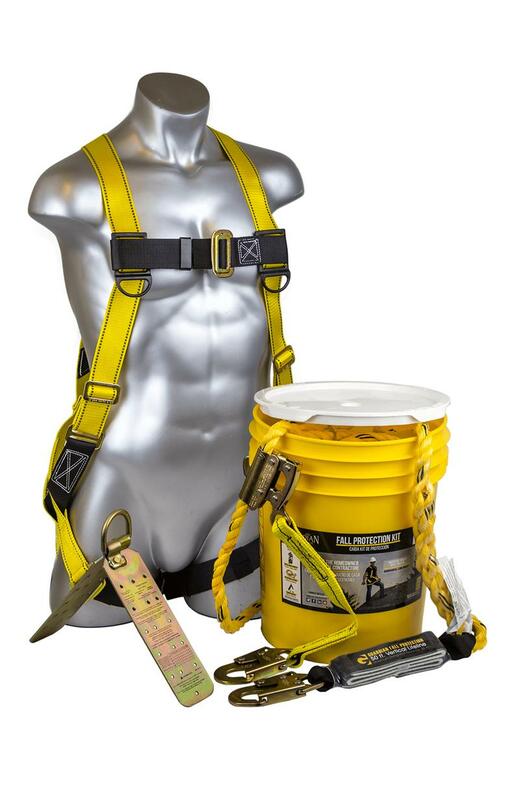 It is one of the few kits available on the market that includes a lifeline with an integrated shock absorber, which allows the worker to never have to worry about incorporating an additional shock absorbing lanyard into their fall protection system. Removing the shock absorbing component from the worker’s back also results in less weight placed on the dorsal D-ring, resulting in an increase in comfort level and ease of movement. The Bucket of Safe-Tie comes in a variety of configurations, and can be customized for specific customer needs.